Stock markets in Asia have seen mixed trading with South Korea's Kospi index up following an interest rate cut but Japan's Nikkei index falling. South Korea's central bank cut rates to 4%, the third cut in a month, helping the Kospi index to end up 3.9%. 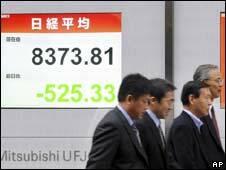 Hong Kong's Hang Seng rose 3.3%, but in Tokyo the Nikkei closed down 3.6%, although it had been down 7% earlier. Toyota shares fell 9.2% as investors reacted to Thursday's news that the firm was cutting its profit forecasts. On Thursday, global shares saw sharp falls, despite interest rate cuts by both the Bank of England and the European Central Bank (ECB). The Bank of England cut UK rates to 3% from 4.5% - a much bigger cut than had been expected - while the ECB cut eurozone rates to 3.25% from 3.75%. The UK's FTSE 100 index ended the day down 5.7%, and on Wall Street the Dow Jones index sank 443.2 points, or 4.9%, nearly matching Wednesday's 486-point slide. On Thursday the International Monetary Fund (IMF) cut its growth forecasts for the global economy. It predicted that developed economies as a whole would shrink by 0.3% next year, having forecast growth of 0.5% less than a month ago. The IMF also cut its 2009 growth forecast for the global economy to 2.2% from the previous estimate of 3%.